Littleton Area Radio Klub is a group of Likeminded individuals that meet at the Little Regional Hospital Cafeteria the second Sunday of every month for a breakfast/meeting to share experiences and fellowship. The meetings usually include topics of interest and learning experiences. 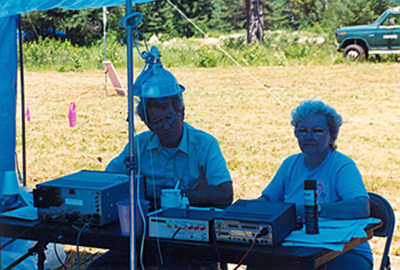 The club also participates in the ARRL Field Day every June; we set up in a remote location with temporary equipment and make contacts for 24hrs. It is a fun way to practice for emergencies and the highlight of a Hams season. A great B-B- Cue is also a big part of Field Day. The Littleton Area Radio Club is affiliated with the American Radio Relay League (The National Cub for Amateur Radio) and is led by President George Blakesley N1GB and Treasurer Lilian Rayno N1SHP. The club provides training and testing for aspiring Hams, and is open to everyone. Dues are currently $10 dollars per year. All club events are family friendly and alcohol free. The club follows the Amateurs Code. Considerate – Never knowingly operates in such a way as to lessen the pleasure of others. Loyal – Offers loyalty, encouragement and support to other Amateurs, local clubs, and the American Radio Relay League, through which Amateur Radio in the United States is represented nationally and internationally. Progressive - with Knowledge abreast of science, a well-built and efficient station and operation above reproach. Friendly - slow and patient operating when requested; friendly advice and counsel to the beginner; kindly asstistance, cooperation and consideration for the interests of others. These are the hallmarks of the amateur spirit. Balanced - radio is an avocation, never interfering with duties owed to family, job, school or community. Patriotic - station and skill always ready for service to country and community.